Hi, you are landed on a good page for your search because I am also a person like you who searched for the same topic of learning online course short period of time ago. I spent so much of time to find the most suitable place to study. After that, I found a website called Udemy. Many questions were evolved from my mind about Udemy like is Udemy reputed to go, is it safe to pay money using credit/debit card, who will teach, quality of course materials, Finally I found everything about Udemy. 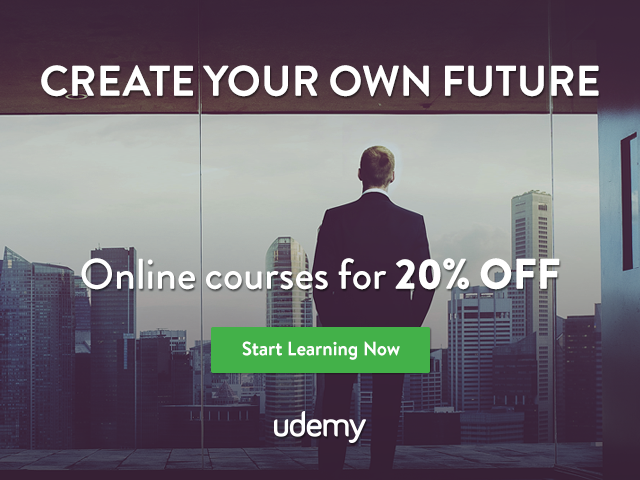 So let me say few things about Udemy. Development- game development, mobile apps, programming languages, Databases, software testing, software engineering, web development, E-commerce, development tools. IT & Software- Network & security, operating system, hardware, IT certifications, others. Personal development- productivity, memory & study skill, career development, happiness, religion & spirituality, self-esteem personal brand myself-esteem, personal finance, stress management, motivation, creativity, personal transformation, leadership, parenting & relationships, influence, other. Design- interior design, graphic design, design tools, user experience, game design, 3D & animation, fashion, web design, architectural design, design thinking, other. Marketing- non-digital marketing, search engine optimization, marketing fundamentals, digital marketing, social media marketing, branding, analytics & automation, public relations, advertising, video & mobile marketing, content marketing, growth hacking, affiliate marketing, product marketing, other. Lifestyle- beauty & makeup, home improvement, food & beverage, travel, gaming, pet care & training, arts & crafts, other. Photography- photography fundamental, travel photography, landscape, wedding photography, mobile photography, portraits, black & white, commercial photography, wildlife photography, video design, photography tools, digital photography. Academic- math & science, social science, humanities. Languages- English, Spanish, Russian, Portuguese, Japanese, German, Chinese, Latin, Arabic, Hebrew, Italian, french, other. Test preparation- college entry, international high school, grad entry exam, test taking skill. Every course is being taught according to above main categories. Sometimes you might think that the YouTube is best for learning using videos but that is not true at all because anyone can upload videos that may be deviated from academic standard and YouTube videos are not very well structured to study purposes. Finally, I recommended Udemy platform to learn various courses from qualified lecturers. I have had personal experience with Udemy. Register now and learn for a discount price like me. And share your experience below comment section. Good luck.